2 x Ringlet. 2 x Speckled Wood. The first Ringlet - Aphantopus hyperantus - of the year. Two were seen. This Rosebay Willowherb - Chamerion angustifolium - is well ahead of my other local specimens. Most are not yet in bud. On the left is Sericomyia silentis - one of our larger Hoverflies. And on the right is a side-shot of the Snipe Fly - Chrysopilus cristatus - that I showed on June 21st. The flower spikes are much shorter (although the one in the picture has been broken off) and more squat than the rather elegant spikes of Circaea lutetiana. And then there's that strong odour of the leaves. Turns out it's Circaea x intermedia - the stable hybrid between Circaea lutetiana and Circaea alpina. It often occurs in the absence of one of the parents, and spreads by underground runners. Much is written in books and on the web about the subtle differences between these plants, but to me it is obvious and clear: Circaea x intermedia stinks and Circaea lutetiana doesn't. I noticed this leaf mine on a Holcus grass (the puparium is the tiny grey 'dash' in the centre of the image). I can't find any documentation that refers to leaf miners on grasses, so I'll have to make an informed guess at an Agromyzid fly. 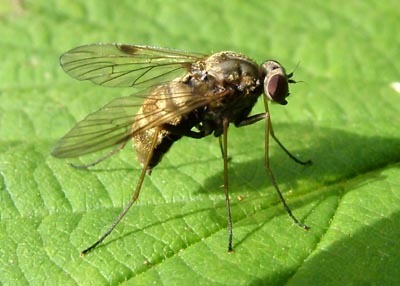 A couple of day's research has shown that it is, indeed, an Agromyzid fly - Chromatomyia milii. These are the flowers and seeds of Sorrel - Rumex acetosa. Crested Dogstail grass has started to flower quite quickly after appearing.